Today’s the first day I managed to avoid going to school in my first 28 consecutive days of university life, and that’s inclusive of Saturdays and Sundays. I finally felt that I needed time for myself with myself, time to just sleep in till 1pm (which I did) and loaf around in bed till dinner time doing whatever the hell I wanted (which I also did). I was planned to meet J, Z and M for dinner afterwards, mainly because J was flying off to Manchester really soon to pursue his undergrad studies. Anyway, he wanted to eat Chinese/Asian food, so being the foodie I took it upon myself to find a place suitable and decided upon Restaurant Ten @ Purvis Street, formerly known as Metropole Herbal Restaurant @ Clarke Quay. Purvis Street is a reasonably long walk from City Hall Mrt mind you, so I was pretty pissed, and utterly disappointed (especially after reading all the reviews about Restaurant Ten) when Z adamantly refused to dine at Restaurant Ten. I’m sure M shared my disappointment too but that said, I guess I should stop being an immature petty food nazi. Purvis Street despite being just a small stretch of road, actually hosts 4 restuarants on my to-go-list, Gunter’s, Garibaldi, Yhingthai Palace & Restaurant Ten so when the suggestion was to eat at Chin Chin, a non air-conditioned kopitiam in the same stretch instead, I grudgingly trudged along with a heavy heart. Am I being a melodramatic food snob? To some extent, very likely…but come on, Restaurant Ten vs a random zi char stall? Only 2 dishes we ordered from Chin Chin could be considered worth ordering again. 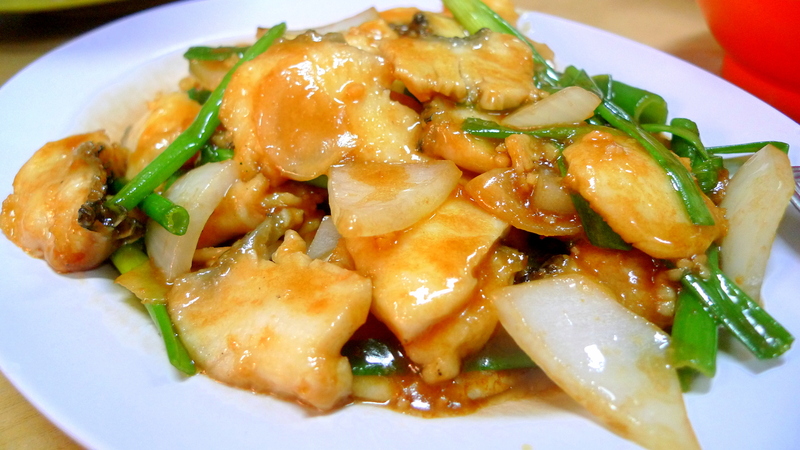 One was the Sliced Fish with Spring Onion. The fish was fresh and the gravy not overly thick or salty. 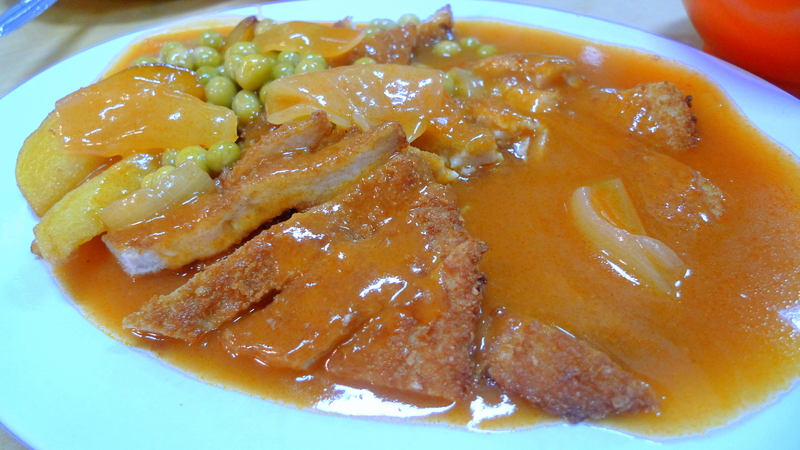 The second dish I felt was above the average zi char stall standard was the Hainanese Pork Chop. While most zi char stalls offer similar pork chops soggy and hard, the one here didn’t suffer the same fate. Stir Fried Baby Kai Lan. Not bad but I would have preferred it with more garlic. The Cereal Prawn was listed as a chef’s recommendation on the menu but it really wasn’t spectacular, it wasn’t even average in my view. 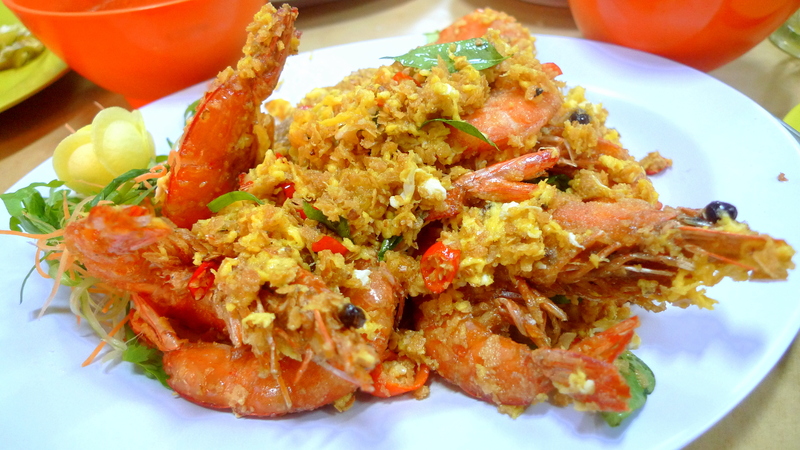 The cereal was soggy with a lack of flavour and the prawns lost it’s crispness fast. 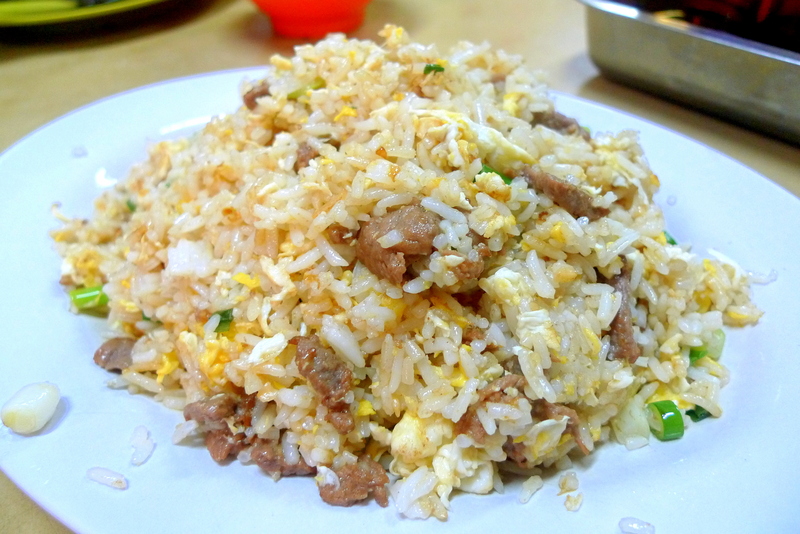 J said the Fried Rice here was good during his last visit here, but today’s Beef & Seafood Fried Rice was a totally different story. They were both really bland and without the “wok hei”, to the point where I even considered whether the cook forgot to put in salt or MSG. 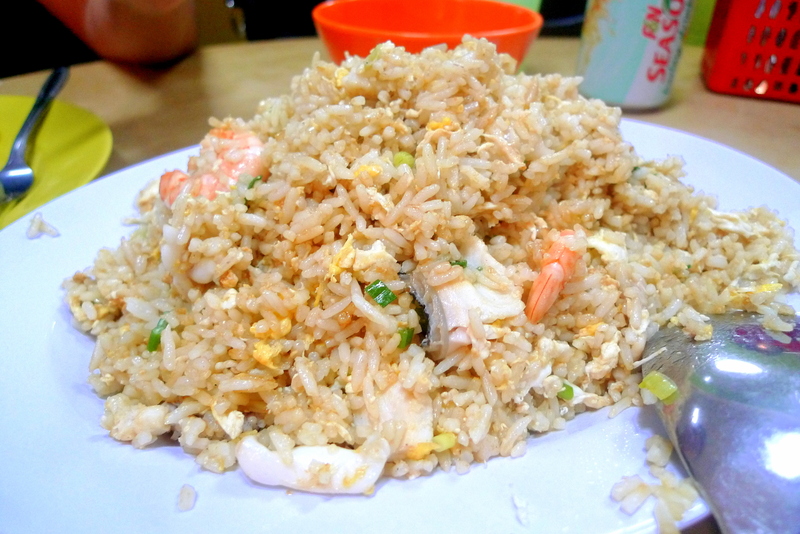 It’s the worst 2 plates Fried Rice I have eaten but luckily we had side dishes, so we managed to use the Fried Rice as a substitute for White Rice, albeit an oiler version. I probably wouldn’t return with the superfluous dining options around the vicinity. Then again, we didn’t get to try the Chicken Rice which Chin Chin is supposedly famous for so my judgments might be premature judgment. 1. i was at chin recently on 28/5/2011. 2. honest, i was utterly surprised with its assorted menu. 3. well, its curry fish-head dish was good enough to set me on fire. 4. the fish was pretty fresh and tasty. 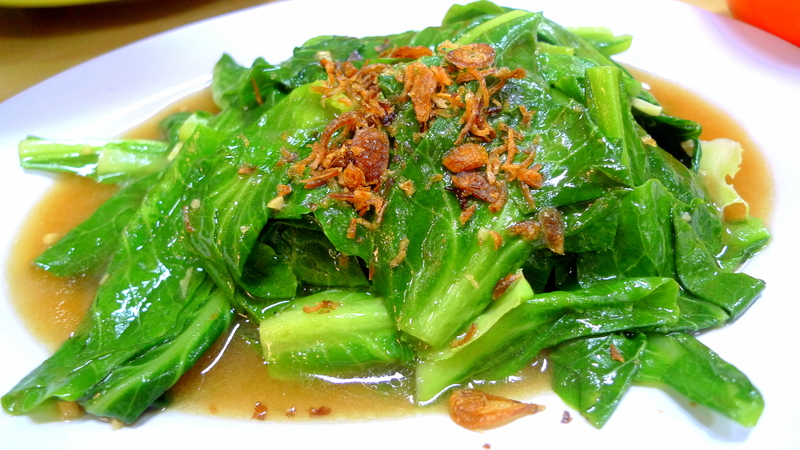 5. the kangkong was well done with barachan. 6. its coffee with cream was thick. 8. yes, i shall return to chin whenever i am in town. 9. btw, its price is affordable. hey glad you had a good experience. perhaps the items I had weren’t their speciality. thanks for the feedback.